Style, durability, and easy maintenance — it’s all here. Equally impressive is the uncompromising performance and easy maintenance. The four-sided PermaTech cap layer resists fading and staining, while the durable composite core means no splintering, cracking, insect infestation, or decay. Available in Cinnabar, Burnt Umber, Graphite, and Warm Sienna. 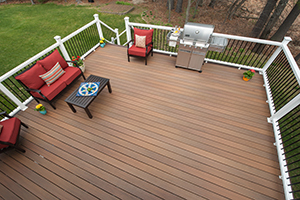 Fiberon Good Life decking offers the low maintenance of a composite at a price that’s closer to wood. Capped on three sides with a tough protective finish, Good Life decking resists staining and fading. And, with its solid composite construction, you can say goodbye to rotting, warping and splintering boards too. 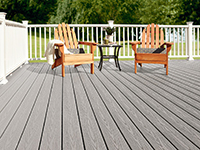 Choose from two solid colors that resemble traditional painted or stained decking. Good Life delivers good looks and great performance at a price that can’t be beat. Available in Cottage Gray and Cabin. For an exceptional outdoor space and the free time to enjoy it, consider Horizon Railing. 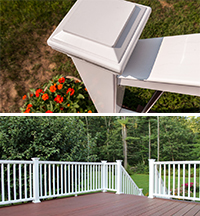 The flat top rail lends a clean look, as well as a handy place to rest your drink. Available in versatile White, Horizon Railing complements any architecture or design aesthetic. Solid composite construction prevents splintering, cracking, and decay, while the protective outer cap resists spills, stains, and UV rays. Horizon Railing is strong, stylish, and so easy to maintain. Railing available in white. Balusters available in white square or black round.